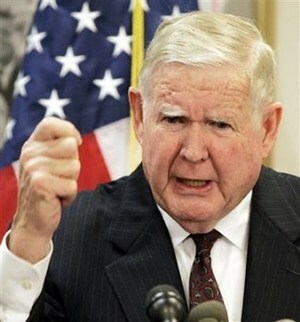 Congressman John Murtha, one of the most powerful and influential Democratic lawmakers on defense issues in the House for more than three decades, died recently in Arlington, Va., at the age of 77. Congressman Murtha “passed away peacefully this afternoon. … At his bedside was his family,” a statement from Murtha spokesman Matt Mazonkey said. Murtha had recently undergone gall bladder surgery and was hospitalized Feb. 2 after complications with his recovery. On Feb. 6 – two days before his death — Murtha passed the mark as Pennsylvania’s longest serving member of Congress, representing the 12th district since 1974. For the last two years, Murtha had served as the chairman of the House Appropriations Committee’s defense panel, which determines where and how much of the Pentagon’s money is spent. In his position as the chairman and earlier as the ranking member of the so-called HAC-D, Murtha was able to steer hundreds of millions of dollars to defense programs in his district, prompting accusations of sweet-heart deals and influence peddling. For all that, Murtha, known as a tough, back-room battler, also enjoyed bantering with reporters and was often much more accessible than many of his fellow cardinals, as appropriations subcommittee chairmen are known. He famously came out against the Iraq war in 2005, shocking many defense experts on Capitol Hill and making the conservative Democrat an unlikely darling of the party’s more liberal wing. His May 2006 comments calling a squad of Marines who stormed a house in Haditha after a roadside bomb attack “cold blooded killers” eroded his image among many rank-and-file troops and veterans’ groups who’d looked to the former Marine colonel and Vietnam vet for leadership on key issues. But his strong advocacy for military spending during tough budget times ingratiated him among service chiefs and their civilian leaders. Last year, departing Secretary of the Navy Donald Winter awarded Murtha its highest civilian honor, the Distinguished Public Service Award. Murtha was a former enlisted Marine who earned his commission in the mid-1950s and served in the Reserves until 1966 when he was activated for duties in Vietnam. During his service there as an intelligence officer, Murtha earned a Bronze Star with combat V and two purple hearts. He was the first Vietnam combat veteran elected to Congress, his biography says.